Expect Hernandez to miss 4-6 weeks assuming no surprises with today’s MRI. X-rays on Aaron Hernandez were reportedly negative yesterday and Pro Football Talk reported that he could be out up to six weeks with a high ankle sprain. Both reports are reassuring, especially the PFT report, which suggests that a team source doesn’t believe today’s MRI will show that Hernandez has a high grade high ankle sprain that might need surgical fixation and an 8+ week rehab. However, that may be the only information we get from the Patriots on this injury. 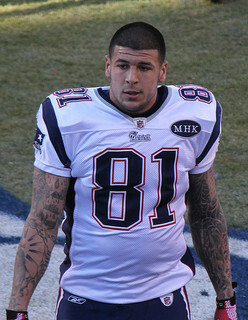 If it’s accurate, conservatively expect Hernandez to miss between four and eight weeks. As is so often the case with ankle injuries, teams are reluctant to confirm that their player has suffered a high ankle sprain. That seems to be the situation with Matt Forte, who was reported to have suffered a high ankle sprain last Thursday only to have that diagnosis denied by Lovie Smith today. The mechanism of injury was certainly suspicious for a high ankle sprain, though there was not a clear enough view on replay to say with certainty. Expect Forte to miss at least this week, but he could be back sooner than the usual 4-6 week estimate given for a high ankle sprain if Smith’s comments are accurate. Ahmad Bradshaw had x-rays on his neck yesterday after taking a hard hit on a second quarter run. Reports are that the x-rays didn’t show any obvious bony injury, but Bradshaw is scheduled for an MRI today for what’s currently being called a cervical neck sprain. That’s a generic diagnosis that could mean he’s sprained muscles in his neck or has a stinger that didn’t resolve quickly. Assuming the MRI shows no significant nerve damage, muscle strength and range of motion will determine how quickly Bradshaw can return to play. Steven Jackson says he sat out most of three quarters yesterday with a groin strain, not the hamstring strain first reported and not as punishment for an unsportsmanlike conduct penalty in the second quarter yesterday. Whether that’s a believable story or not remains to be seen, but Jackson has a long history of nagging muscle strains in his legs. His practice participation should be interesting. Antonio Gates has played through pain before and local observers expected him to play yesterday, making the decision to put him on the inactive list something of a surprise. Gates suggested after the game that the decision really wasn’t all that close and that he wasn’t comfortable playing with the injury if he wasn’t able to practice. That’s both an indication of how difficult it can be to play through a rib injury (even with painkilling injections) and possible evidence that the injury could be severe enough to also keep him out in Week 3. Jeremy Maclin left yesterday’s game after aggravating his hip pointer while blocking downfield. This injury can be extremely painful and is difficult to pad and protect. I don’t expect him to practice much this week and it’s very possible that he could sit in Week 3. DeSean Jackson looked to be moving gingerly early in the game yesterday but had no issues as the game progressed. Hopefully, there will be no setbacks with his hamstring strain in practice this week. Setting aside concerns that his foot injury was limiting his route tree and ability to separate, Hakeem Nicks exploded for a huge day against Tampa Bay yesterday. He also looked to have tweaked his sore foot at the end of a long pass play, but said after the game that he felt fine. It’s likely that the Giants will continue to limit his practice participation early in the week, but there’s little reason for concern as long as he continues to see some practice time on Friday and plays nearly all the game snaps as he has in the past couple of weeks. Ryan Mathews is right on target for a six week return. It’s no surprise that the Chargers held him out yesterday since he had been cleared for contact less than 72 hours before the game. The extra week of full contact practice should strengthen Matthews’ confidence and confirm that he’s in condition to handle a full workload. He’ll play in Week 3 and expect the Chargers to limit his carries only slightly more than they usually would. Jason Kelce suffered a torn MCL and partially torn ACL. He’ll be out at least four weeks and probably closer to six (given the added difficulty of rehab with the ACL injury) to allow the MCL to heal. He’ll have arthroscopic surgery to look closely at the extent of damage to his ACL tomorrow. It’s often a dicey proposition to allow a partially torn ACL to heal non-surgically. Blaine Gabbert will have an MRI today to evaluate thigh and/or toe injuries he reportedly suffered yesterday. There’s been no indication that the Jaguars fear Gabbert’s injuries are severe. The Tennessee offense only played 42 snaps yesterday. Kenny Britt was on the field for 19 of them and reportedly had no difficulty. He should have a more extensive role in Week 3. Denarius Moore returned to the starting lineup and was targeted eight times. Although he struggled with cramps, the hamstring didn’t appear to limit him. Bernard Pollard left yesterday’s game with a rib contusion, but expects to return next week. Sidney Rice took a hard hit and left the game, presumably for further evaluation of a possible head injury. Pete Carroll seemed to avoid the question in his post-game conference, but Rice will likely be monitored very closely this week after being placed on IR last year due to repeated concussions. Brian Orakpo (potentially severe pectoral strain) and Adam Carriker (reportedly out for the season with a torn quad muscle) are the latest injuries to a Washington defense that’s having its depth tested. David Diehl will be out multiple weeks with an MCL sprain.